Access to the Camp is through a private road leading off Mt Keira Road, and the usual means of reaching the Camp is to leave the F6 Freeway from Sydney at the Figtree Exit (Southbound), turn left briefly towards Wollongong from the Freeway Exit, and then left up Mt Keira Road. The Camp is 4.7 km beyond the Mt Keira Post Office/General Store. The Camp may also be reached from the Goulburn-Sydney Freeway (Hume Highway 31) by departing the Freeway at the Wollongong Exit, and turning off the Picton-Wollongong Road (88) at the Mt Keira Exit. 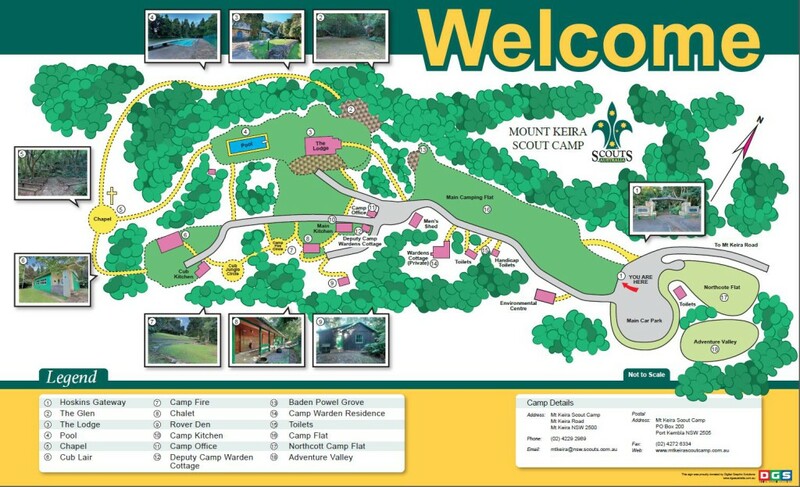 The entrance to the Camp is 1.0 km past the Mt Keira Summit Exit. View Google Map.